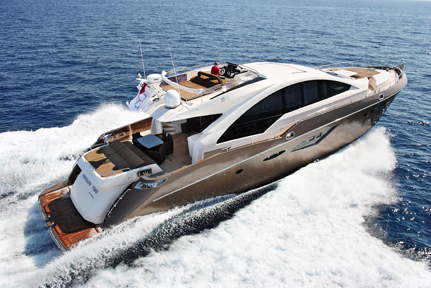 Queen yachts have launched their new Queen 86. 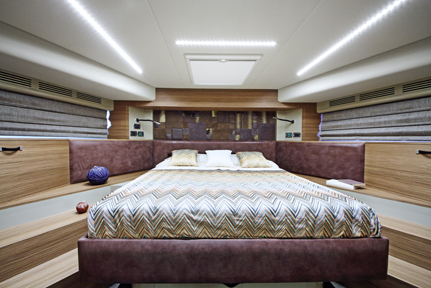 Designed by Architects Vienna & Locarno of the TDF Studio in Milan, with the support of the technical staff of Queens Yachts, and built by Flag Marine shipyard. 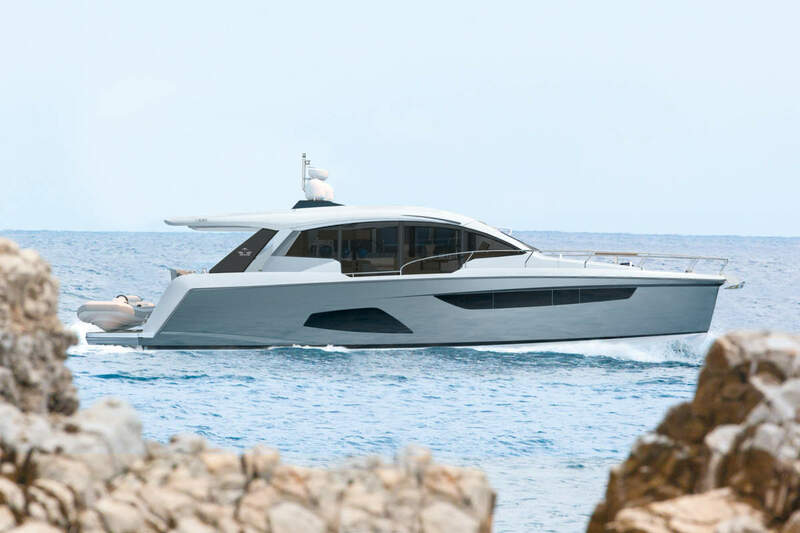 The flagship model from Queen Yachts has been another step forward for the Italian brand and encapsulates new design and innovation. 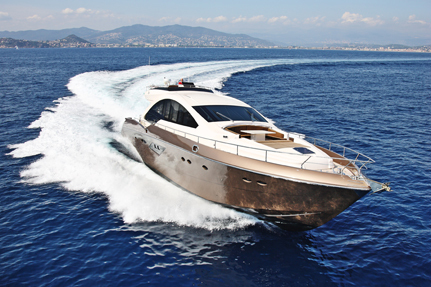 The Queen 86’ Sport Fly flagship has been a great success for the company, cementing the working partnership with Flag Marine, Tuscanian shipyard with over 30 years of experience. 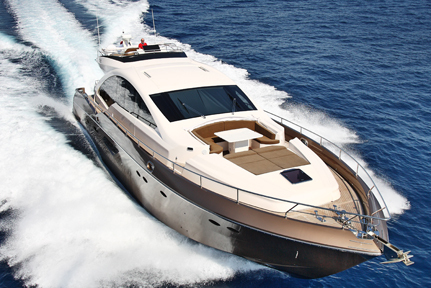 From this cooperation, a high performance, original, elegant yacht was born. 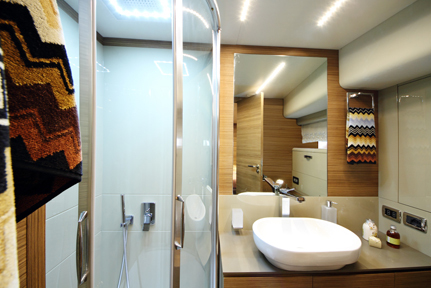 Its racy and modern external profile with a fluid shape favors the increase in internal volume, creating a large space especially in the hall, the stern cockpit on the main deck and the fly. 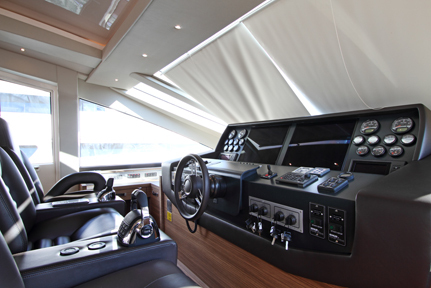 This is the first novelty in the family line of Queens Yachts, which in this model also introduces a second-pilot driving seat with foldaway console. Well-distributed spaces create a comfortable place for the sunbathing cover sofa. 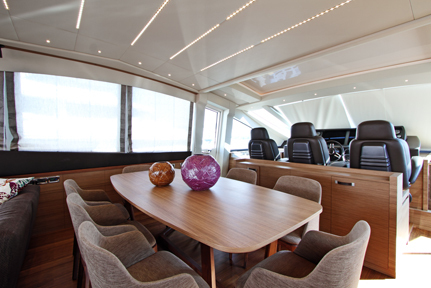 All the stylistic elements that distinguish Queens Yachts are refreshed in Queen 86’ with an absolutely unique style: the windows of the superstructure, the wide glass walls, the big foldaway door which divides the cockpit from the hall, together with the inimitable performance of any Queens yacht. As an outstanding novelty, Queen 86’ offers an engine as innovative as high-performance: four Volvo Penta QUADRUPLA 900 IPS engines have been installed on board. It is the first installation in Europe and the second one in the world. These engines guarantee optimal maneuverability, and the Joy stick enables mooring even without crew. Queen 86’ can cruise at 25 knots (32 knots during testing). And that is not all: Queens Yachts and Flag Marine adopted the best technological solutions available on the market featuring the Seakeeper active gyro stabilizers giving a perfect stability during both harbor and open-sea navigation. The HUMPHREE flaps, another plus for this boat, offers satellite-controlled, automatic attitude stabilization at any preset speed, regardless of the sea conditions. For maximum agility during descent of the water toy, a garage in the stern is equipped with a truck system and a tender-lift system for the bridge. 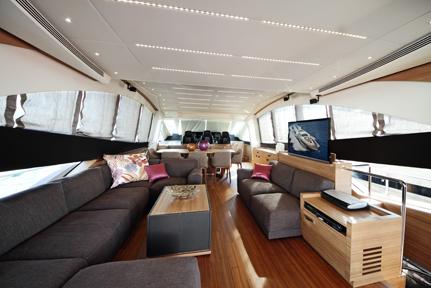 Versatility characterizes also the spacious and highly modular sundeck area in the bow, featuring a sofa with cover, an adjustable table, a complete cuisine cabinet and a sun pad. Queen 86’, 24 m long, has two electronic lateral doors in the main deck and a brilliant disposition of spaces as for the galley separated from the saloon to guarantee the maximum privacy for the guests. The dining area can accommodate eight to ten people. A sophisticated mix of walnut panels and white lacquers creates a harmonic interplay of colors, and precious leather furniture illuminated by a led system gives a delicate effect. 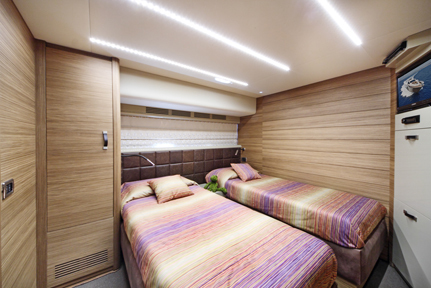 In the lower deck we find the sleeping quarters with 4 cabins: the master cabin in the stern, the VIP cabin in the bow and two guests cabins, each with a private bathroom. 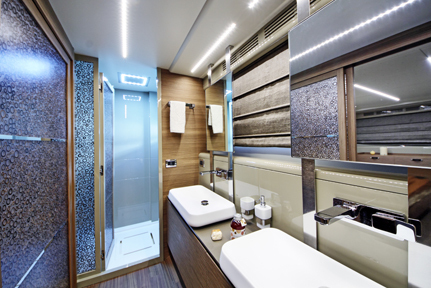 Aft, and accessible both from deck and inside, are the crew quarters composed of an en-suite cabin with three beds, bathroom and access to the galley. All cabins feature Hi-Fi TVs and Dolby Surround. 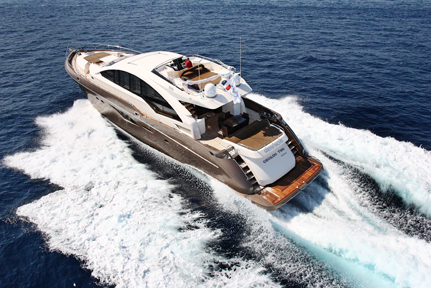 In line with Queen’s brand philosophy, the Queen 86’ incorporates the right mix of technical innovation and cutting-edge design.